The biggest problem with yesterday’s revelation that Texas Gov. Rick Perry has reopened the President’s birth certificate as a campaign issue was the fact that there was no audio or video of Perry’s interview with Parade Magazine. 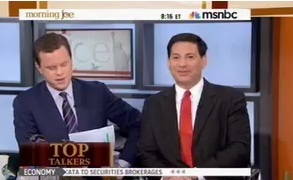 Morning Joe host Joe Scarborough remedied that situation, somewhat, this morning, when he drafted Willie Geist and Mark Halperin into a dramatic reenactment of the beleaguered former frontrunner’s absurd interview, in which he expresses doubt about the President’s birthplace. From Scarborough’s lips to Reagan’s ears.